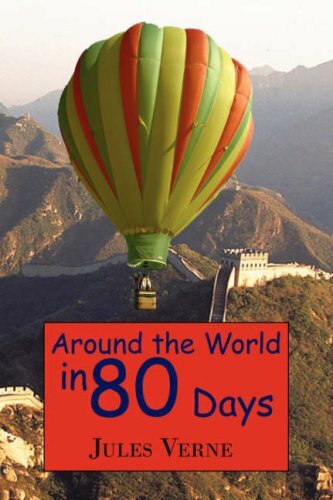 Phileas Fogg rashly bets his companions £20,000 that he can travel around the entire globe in just eighty days—and he is determined not to lose. Breaking the well-established routine of his daily life, the reserved Englishman immediately sets off for Dover, accompanied by his hot- blooded French manservant, Passepartout. Traveling by train, steamship, sailboat, sledge, and even elephant, they must overcome storms, kidnappings, natural disasters, Sioux attacks, and the dogged Inspector Fix of Scotland Yard to win the extraordinary wager. Joam Garral, a ranch owner who lives near the Peruvian-Brazilian border on the Amazon River, is forced to travel down-stream when his past catches up with him. Many aspects of the raft, scenery, and journey are described in detail. A series of unexplained happenings occur across the eastern US, caused by objects moving with such great speed that they are nearly invisible. The first-person narrator John Strock travels to the Blue Ridge Mountains of North Carolina to investigate.